Founded in 1988, Veatch Ophthalmic Instruments has been an integral part of the Ophthalmic community with a rich history and an exciting future. Veatch has gained the reputation for outstanding service and commitment to customer satisfaction to optometry professionals nationwide for over 30 years. When the marketplace needed new and more efficient ophthalmic technology, Veatch set out to create ReSeeVit digital imaging. ReSeeVit, known as the "Total Solution," combines the best acquisition devices in the market, including the elite HR Slit Lamp Camera, Canon CR-2 Non-Myd Fundus Camera, and Endothelium/Modi WaveFront Topographer – resulting in superior image resolution and archive capability. Whether our clients have the funds to invest in the newest technology, or if they are working within a strict budget or small space constraint, we will help them choose the solution that will fit. As the demand has grown, this division of our company travels worldwide to test and make available ophthalmic products that will heighten the success of any practice, large or small. Importing products to our specifications allows us to insist on and maintain a high level of quality and opens the door for Veatch to sell more products. As 30 year veterans in the ophthalmic industry, we pride ourselves in being known as a reputable, value-oriented, service minded, equipment provider. 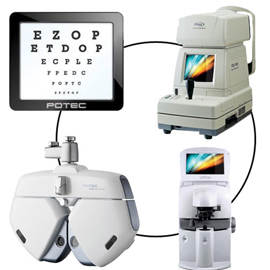 We look forward to working with you today to identify your ophthalmic equipment needs!